At Eagle Animal Hospital and Pet Resort in Riverside, our clients and their pets are like members of our family. With our most recent renovation, we can add several features to increase your comfort and your pet’s comfort in the waiting area while he or she recovers from an injury or procedure. Our waiting room features a coffee bar and a gorgeous, serene saltwater aquarium. We’ve even added a separate waiting area for cat parents and their felines to reduce the stress of your visit. Our wraparound reception desk makes checking in and out easy and stress-free. Additionally, our intensive care units are divided for cats and dogs, allowing them isolated recovery time and a comfortable experience during their stay. These are just some of the ways in which we strive to meet and exceed the needs of our clients and their cherished companions. We also fill prescriptions in-house, provide microchip pet identification, health certificates, client counseling, and end-of-life services. Our fully updated in-house veterinary pharmacy was designed with client convenience and pet’s health in mind. As your pet’s prescribing veterinarian, we can ensure prescriptions are filled correctly, in the right form, and in the right dose as quickly and conveniently as possible. Unlike veterinary practices which send their clients elsewhere to fill prescriptions, at Eagle Animal Hospital and Pet Resort we can thoroughly discuss the medication, its usage, and any possible effects or interactions with other drugs it may lead to. We can even administer the first dosage in certain cases – or at least show you how. When it comes to the special medications for pets, no regular pharmacy can guarantee the same level of service. We maintain a wide variety of pharmaceuticals, vitamins, shampoos, flea and tick control products and heartworm preventatives to meet your pet’s needs . We also carry Royal Canin pet foods. 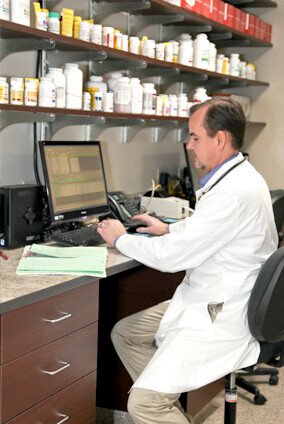 Prescription refills are easy, too – simply give us a call or submit a request online! At Eagle Animal Hospital and Pet Resort, we can’t count the number of times we’ve been able to reunite lost pets with their owners by scanning their unique microchip numbers. Remarkably, in December 2015 one of our microchip clients was reunited with his Northland family after having been missing for a year-and-a-half. Brodie, a nine-year-old yellow lab, escaped from his family’s yard while they were installing a new fence. His collar slipped off in the process. More than a year later, Brodie was caught by some concerned citizens who had noticed the dog roaming their neighborhood for weeks. The couple brought the dog to a nearby veterinarian who scanned him for a microchip, and the rest is tail-wagging history. Stories like Brodie’s aren’t unique to our hospital alone, however. This is why we stand firm behind the belief that all pets should be microchipped. Once registered with your phone number and address, your pet can be identified quickly and easily by animal control officers, shelters or at veterinary hospitals around the world. Updating your personal information is easy and convenient and should be done whenever your contact information changes. We use the HomeAgain microchip system. HomeAgain membership offers additional benefits such as proactive pet recovery and free access to ASPCA Poison Control. HomeAgain also comes with a number of very useful services to pet owners such as their National Pet Recovery Database, Lost Pet Specialists, Rapid Lost Pet Alerts, Lost Pet Medical Insurance, Travel Assistance for Found Pets, and more. If you travel with your pet, Eagle Animal Hospital and Pet Resort can provide Interstate and International health certificates. We ask that you investigate your destination’s requirements prior to your appointment. Many countries require Rabies titer testing and microchipping. We can provide these services for your pet in advance of your departure. As each destination country has different requirements for your pet’s entry, you are responsible for supplying the list of requirements that need to be met for traveling. We can only accommodate the guidelines you provide and cannot assume any responsibility for those which may later be deemed unmet or for cases of quarantine, denial of entry, or costs incurred due to those unfulfilled requirements. At Eagle Animal Hospital and Pet Resort, client education is a top priority. For this reason, we offer a number of counseling services for pet parents caring for animals with behavioral issues or unique dietary needs, as well as for those coping with the loss of a pet. For Pet Behavioral Issues – Some behavioral issues are rooted in medical concerns. We can discuss these possibilities with you and rule out potential underlying causes. For more involved behavioral cases, we can refer patients to Beyond the Dog. We also offer two courses, in puppy socialization and obedience, taught by trainers from Beyond the Dog. For Pet Nutritional Concerns – Many pet owners may not realize the effects nutrition has on their pet’s organs or pre-existing conditions. We can discuss the ways in which nutrition affects the heart, respiratory and kidney diseases, osteoarthritis, and the urinary tract. We offer Royal Canin pet foods and can discuss special diets for obese pets. For Pet Grief – Our compassionate veterinary team understands the passing of a beloved pet is never easy. You have a right to feel pain and grief. Someone you love has died and you feel alone and bereaved. You may also feel anger and guilt. We offer grief counseling to our clients to help cope with such a loss. To help ease the burden of saying goodbye and the confusion of knowing what to do after a pet has died, we offer cremation services. We encourage you to speak with your veterinarian and include end-of-life wishes for your pet as part of his or her medical record before they become an urgent matter. Taking the time to plan, as challenging as it may be, will lessen the pain and stress for you and your pet. For more information about the veterinary client services that Eagle Animal Hospital and Pet Resort offers or to schedule an appointment please give us a call at (816) 741–2345. ©2017 Eagle Animal Hospital - Do Not Copy | All rights reserved.